Excerpted from Vegan Fitness for Mortals by Ellen Jaffe Jones. A smattering of studies compare the performance of vegan and vegetarian athletes to meat-eating athletes. In a study done at Yale, meat-eating athletes had half the endurance of the vegetarians, even when the vegetarians were sedentary. The study concluded that a diet free of animal flesh is conducive to endurance. Another study out of Denmark determined that men eating a diet of meat and vegetables could pedal a bicycle for 114 minutes before muscle failure occurred, but riders on a high-meat diet could only ride for 57 minutes before experiencing muscle failure. Vegan riders, on average, could pedal for 167 minutes! Turns out I had the good fortune to meet one of the best senior sprinters in the United States. In 2012 Jeanne Deprano set the record for the mile in the women’s seventy-five to seventy-nine age group at six minutes, forty-seven seconds. (A mile run in less than seven minutes is awesome for anyone at any age.) I didn’t know any of this as we trekked back to her dorm room. Jeanne treated me to a decadent raw meal of dehydrated seed crackers and an array of nut butters, veggies, and fruit. She told me that the first thing she does after checking in for any competition is take her empty suitcase to the grocery store and load up with the food she’ll need for her stay. Inflammation is part of the body’s immune response to injury and irritating substances. Scientists believe that endotoxins, a type of bacteria found in animal products, may enter the human bloodstream and cause inflammation. Just a single meal of meat, dairy, or eggs can trigger an inflammatory response within hours. Foods high in sugar and saturated fats can also trigger overactivity in the immune system and cause inflammation. I’ve come to believe that one reason I’m able to frequently place in my age group in races is because my meat-eating competitors are developing arthritis and dropping out of competitions. I also observe that my meat-eating friends don’t have the kind of relatively easy recovery rates that vegan athletes commonly report. Even the mainstream publication Arthritis Today, the magazine of the Arthritis Foundation, has stated that in order to reduce arthritis inflammation, it’s important to cut down on or eliminate meat. A vegan diet is generally anti-inflammatory because it includes no meat or dairy products. Does every kind of vegan diet protect against inflammation? Not entirely. 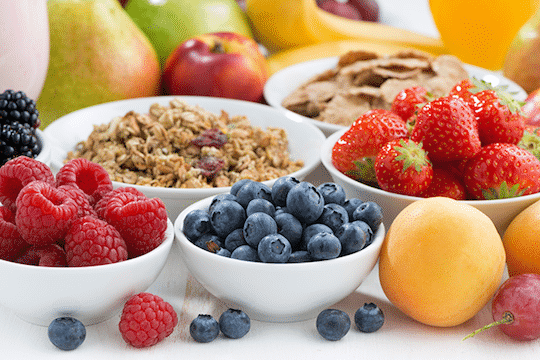 It’s important to eat whole grains and avoid refined grains, such as white bread, cereal, and pasta. Whole grains have less sugar and more fiber, which reduces the levels of C-reactive protein. Ideally, purchase intact whole grains that need to be cooked before they can be consumed. If you’re buying a processed product, such as bread, make sure that a whole grain is the first ingredient. ▪ Beets. The greens and even the roots of beets have long been associated with purifying and anti-inflammatory properties. ▪ Berries. 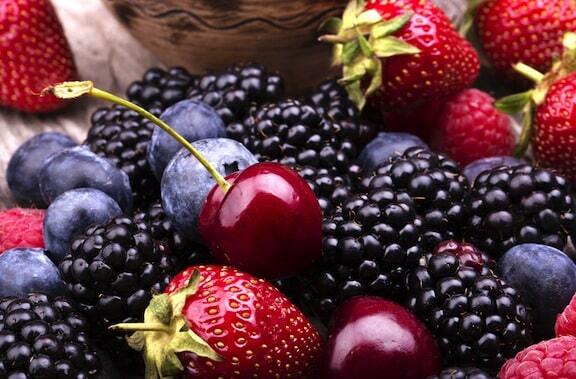 Studies point to the rich colors of berries, pigments known as anthocyanins, as potent anti-inflammatories. Blueberries have received much acclaim for their potential to prevent Alzheimer’s disease, and strawberries are linked to lower levels of C-reactive protein, an indicator of inflammation. ▪ Dark green leafy vegetables. Collard greens, kale, spinach, and turnip greens are rich in vitamin E and known for fighting cytokines, markers for inflammation. ▪ Garlic and onions. Known for their cancer-fighting properties, the dynamic duo of garlic and onions has also been shown in studies to be anti-inflammatory rock stars. Garlic is as effective as non- steroidal anti-inflammatory drugs (NSAIDs) for shutting down inflammation, and onions, which contain the phytochemicals allicin and quercetin, fight free radicals that cause inflammation. 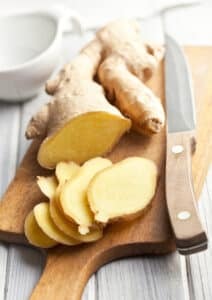 ▪ Ginger and turmeric. Ginger and turmeric are powerhouse staples of Indian cooking that have appeared in several studies as inflammation blasters. Turmeric, which gives everything it touches a golden color, helps to turn off a protein that triggers inflammation. ▪ Nightshade vegetables. Tomatoes and peppers are in the night- shade family and are purported to cause inflammation. However, these foods may affect some people but not others. Lycopene, found in pink and deep-red fruits and vegetables, has been shown to reduce inflammation in the lungs. Cooking foods often releases more nutrients, and cooked tomatoes have twice as much lycopene as uncooked tomatoes. ▪ Soy. Several studies have shown that soy reduces inflammation in bone and in the heart. Processed, concentrated soy in the form of soy isoflavones does not demonstrate the same beneficial effects. Therefore, choose edamame, tofu, and soymilk rather than pro- cessed soy burgers and hot dogs whenever you can. This excerpt from Vegan Fitness for Mortals reprinted by permission of The Book Publishing Company, ©2016 by Ellen Jaffe Jones. You might also enjoy: The High Performance Vegan Athlete by Brendan Brazier. Great article. Unfortunately where I live Blueberries are petty hard to find and the funny thing is that sometimes 500 grams of berries cost more than 1 kg of meat.